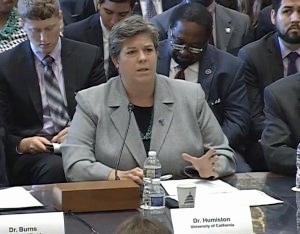 VP Glenda Humiston along with other higher education leaders recently addressed the US House of Representatives regarding the importance of agricultural research. Key points made by Humiston included discussing the vital partnership between University of California Agriculture and Natural Resources and California's multi-billion dollar agricultural sector, and in addition to active research, the extensive outreach that is conducted through direct approach, peer reviewed articles and filed patents. While progress is being made, much, much more could be done with vital funding.